Why Write Symphonies? : Deceptive Cadence Kevin Puts won the Pulitzer Prize for his opera Silent Night. He's written concertos and lots of other music, but he says writing a symphony is a particularly moving experience: "I need a private place where I can express the spiritual, the epic, the heartbreaking without shame or embarrassment." 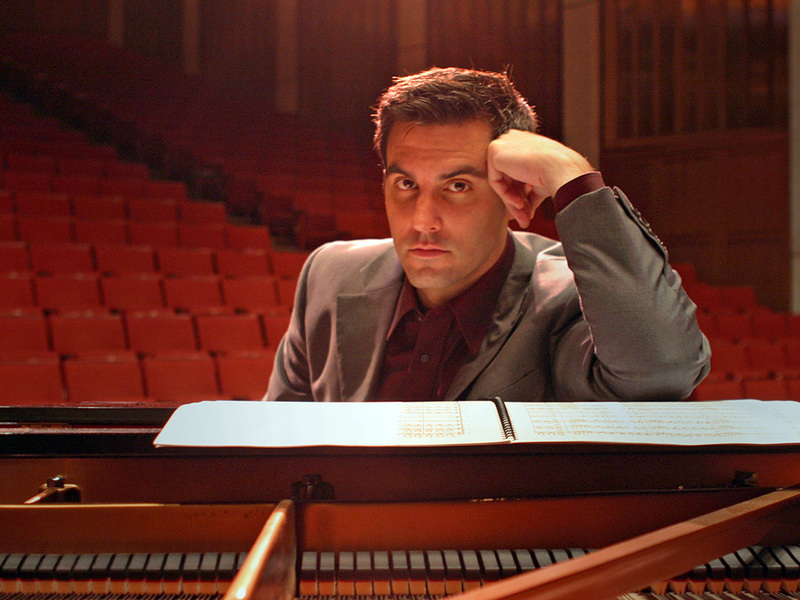 Pulitzer Prize-winning composer Kevin Puts is still inspired by the age-old symphonic form. In 2007, I was interviewed by a journalist over lunch a day before the premiere of my Violin Concerto. One of his first questions was, "So why do you write in these old forms, the symphony, the concerto ... ?" I told him that these were simply titles which imply nothing about the form, which was another thing entirely. But it led me to ask myself: What is a symphony these days? If it no longer comprises a four-movement structure with an energetic first movement, a slow movement, a scherzo, and some kind of quick rondo, then what exactly characterizes it? And why write one? When I was in school in the 1990's, the music getting the most attention in this country sported perky, tongue-in-cheek titles, written in either a "clean" or a "dirty" post-minimalist style, with either an actual drum set or the orchestrated suggestion of one. It was exceptionally attractive and well written and, though I couldn't find my own way into this style, I certainly tried my hand it at. In my first lesson as a doctoral student of Christopher Rouse, he said, "OK, let's hear your best thing." I responded with a recording of a lively, metallic, six-minute orchestra piece called Network which I had written for the California Symphony. Afterwards, he nodded his head routinely. "Yeah, sounds like Adams or Torke." I quietly fumed because I knew it was true. I suddenly felt a true crisis of identity — the kind we composers face at least once in our lives — and a sense of desperation for a voice which, if not utterly and earth-shatteringly original, at least felt personal. Rouse is notorious for his heavy listening assignments (" ... for this week, listen to the complete Ring cycle, you want such-and-such a recording and the LP number in the library is such-and-such ... ") and with all the piano playing and writing I was doing in school, it certainly wasn't easy to complete them. However, I do not believe I would be the composer I am without the first installment of these assignments: an exhaustive survey of the 20-century symphony. Over the course of a semester, I listened to symphonies by Mahler, Sibelius, Shostakovich, Sessions, Harbison, Rouse himself (my choice), Corigliano, Copland, Rautavaara, Prokofiev, Aho, Kancheli, Henze, Rachmaninoff, Barber, Bernstein, Zwilich, Stravinsky, Vaughan Williams, Lutoslawski, Hartmann, Piston, Schuman (sic, that's William), Harris and Ives. I know there were others, but it was a bit of a blur. Ever heard a symphony by Allan Pettersson? I've heard two (of his 17). What I learned I suppose I already knew. The symphony is not a trifle. It is not cute or hip or light. It says something important — about life and death and cosmic stuff — and it does so without embarrassment. What it needs to say cannot be said in a few minutes; it is not short attention span music. It is music for the patient listener. Often, a symphony unfolds in the manner of a story in some sense or another; there is something narrative in the air. To emphasize this aspect there is, toward the end, often a looking back to the places we have been. The model perhaps is the finale of Beethoven's Ninth, in which the materials of the previous movements are briefly recalled within the structure of a faux-recitando before achieving the symphony's glorious destination in the Ode to Joy. Then there's the last movement of Copland's Symphony no. 3, which culminates in a rather wondrous polyphony of melodies from the first three movements. We get a sense of the journey, where we've been, how far we've come. It is an unforgettable experience — and one particular to the college years — to hold the essences of all these pieces in one's head at once, and a daunting task to then try and compose something original. But alas, I had a dissertation to write, and I thought: Why not a symphony of my own? Perhaps it was too close on the heels of all this listening but, for better or worse, what emerged was a first attempt at polystylism (to use a label pinned on my work by a few critics over the years), an attempt at expressing my ideas broadly without succumbing to pressure to hurry things along, at letting things unfold at the rate they felt right to me. While any correlation with symphonic expression may be at best circumstantial, I also feel this was my earliest attempt at speaking with utmost sincerity, at digging as deeply as I could emotionally. On the surface, people might describe me as easy-going, joke-cracking, self-deprecating, but this is not the place where my music wants to live. I need a private place where I can express the spiritual, the epic, the heartbreaking without shame or embarrassment. My Symphony No. 1 led me to this place. Every composition student is told never to write a long piece for orchestra because it will never be played. This is good advice. However, since writing my first symphony, I have written three others, as well as several other long pieces including Falling Dream for the American Composers Orchestra, Sinfonia Concertante for the Minnesota Orchestra, and a number of concertos for various instruments, all around 25 minutes long. They are rarely played. In fact, I can count the number of performances of each of these, with the possible exception of my Symphony No. 2, on one hand. It's true: The short and snappy concert openers get played far more often. Strangely, this doesn't bother me the way it probably should. I feel very fortunate for the opportunities I had to write the pieces and the symphonic genre has led me to some wonderful places. Dale Johnson, artistic director of Minnesota Opera, tells me he knew immediately I was the guy to write the opera Silent Night when he listened to one of my symphonies on the car ride home from work. He says it was the control of the big picture, the long arc, which impressed him, and though I was as green as they come, he felt I would be well suited for opera. An opera can be a symphony with singing, and with a real story rather than an imaginary one. With opera, I use the same tools I use to write a symphony. I don't know how to write a series of "numbers" and then connect them all somehow, though other composers do this beautifully. I do best when I think of the broad picture, the complete journey. I am always looking down the road to see where the materials can go, how they are going to develop. In the end, maybe what that journalist implied was right. Maybe it isn't too cool to write a symphony anymore. But how cool anyway are we who love the inexorable rising scales at the opening of Beethoven's Seventh, those wicked, angular piano chords in the first movement of Stravinsky's Symphony in Three Movements, the counterpoint in the last movement of Mozart's Jupiter symphony, the epic ending of the Sibelius Fifth? We are moved in that way in which only the symphonic literature can move us. For me, the genre continues to feel right and true to who I am. I owe a lot to it. Kevin Puts won the 2012 Pulitzer Prize for Music for his opera Silent Night. His Flute Concerto received its world premiere Aug. 2 at the Cabrillo Festival. He teaches at the Peabody Institute of the Johns Hopkins University.